Americans are distraught as tightly held economic and political power drowns out their voices and values. Legendary Diet for a Small Planet author Frances Moore Lappé and organizer-scholar Adam Eichen offer a fresh, surprising response to this core crisis. This intergenerational duo opens with an essential truth: It’s not the magnitude of a challenge that crushes the human spirit. It’s feeling powerless—in this case, fearing that to stand up for democracy is futile. It’s not, Lappé and Eichen argue. With riveting stories and little-known evidence, they demystify how we got here, exposing the well-orchestrated effort that has robbed Americans of their rightful power. But at the heart of this unique book are solutions. Even in this divisive time, Americans are uniting across causes and ideologies to create a “canopy of hope” the authors call the Democracy Movement. In this invigorating “movement of movements,” millions of Americans are leaving despair behind as they push for and achieve historic change. The movement and democracy itself are vital to us as citizens and fulfill human needs—for power, meaning, and connection—essential to our thriving. 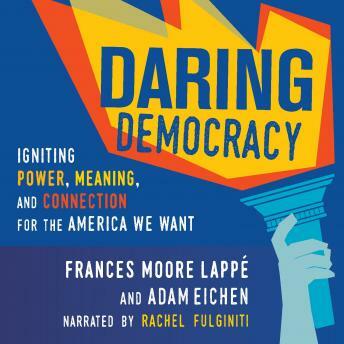 In this timely and necessary book, Lappé and Eichen offer proof that courage is contagious in the daring fight for democracy.